Give maintenance a treat! 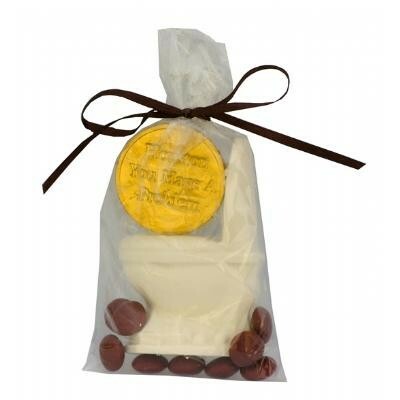 1.92 oz Clear cello bag filled with 1 chocolate candy toilet bathroom fixture, 1 chocolate candy coin and 0.32 oz Colorific chocolate candy Bites (compare to M&M''s). Toilet available in all four flavors. 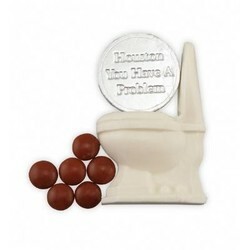 Coin available in milk chocolate candy (silver, gold, green, blue, red or purple) or dark mint (silver or gold). Choose from our stock coin messages or create your own custom coin for an additional $60 (v) setup charge. Colorific chocolate candy Bites available in milk chocolate candy only. Price includes 4 color label applied to the bag. Makes a great food gift or plumber promotional giveaway.